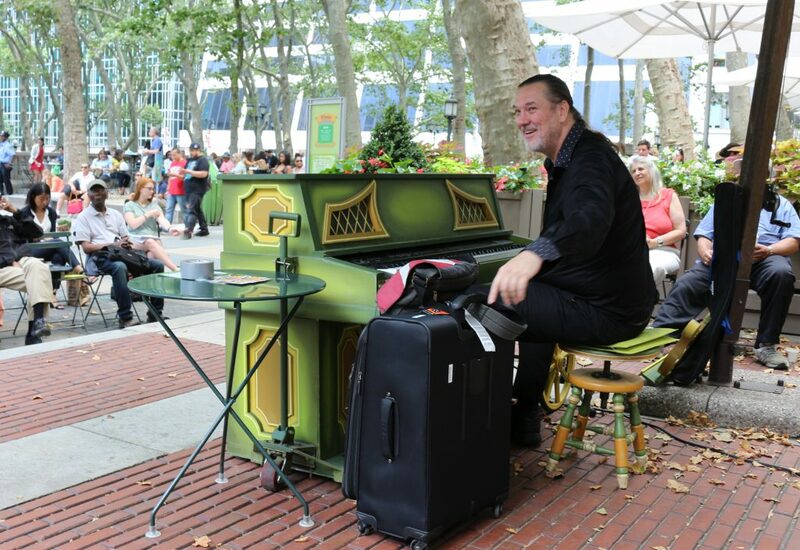 Jon Weber, just having arrived back in New York and direct from the airport, entertained young and old (and in-between) today as the featured performer at Piano in Bryant Park. On the bill were numbers from the American Songbook including by Hoagy Carmichael, George Gershwin, Fats Waller (if my ear was right), whoever wrote Happy Birthday, and many more. What a swinging way to spend my lunchtime! 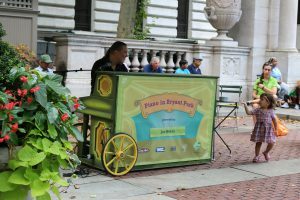 Jon will be playing in the park Wednesday and Friday from 12:30 to 2:30, and Thursday from 2 to 4 with a sing-along. 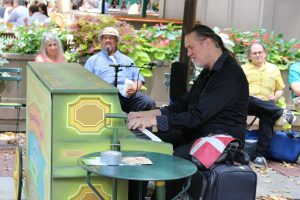 Every day from July 17 through 31, the International Keyboard Institute and Festival will be holding keyboard concerts, afternoon lectures and master classes at the Kaye Playhouse and Lang Recital Hall. The list of marquee performers includes Alexander Kobrin, Alexander Schimpf, Claire Huangci, Geoffrey Burleson, George Li, Jeffrey Swann, Jerome Rose, Jäger Meisters Chamber Orchestra, Magdalena Baczewska, Massimiliano Ferrati, Philippe Entremont, Stanislav Khristenko and Xiayin Wang. Concerts at the Kaye by the marquee performers are $20 each. We are very excited about attending those, but also about concerts, lectures and masterclasses that are free and open to the public, including the MacKenzie Award competition rounds! The Institute maintains a page with links to prior-years’ concerts. At the conclusion of the Festival are the presentations of the Dorothy MacKenzie Artist Recognition Scholarship Awards, open to full-session participants only. Stage is set for Jens Barnieck at the German Consulate in New York.